Displaced Somalis. Photo: UN Photo/Tobin Jones. Creative Commons BY-NC-ND (cropped). What was the reason for your last move? From 2008 to 2012, around 144 million people around the world were forced from their homes by natural disasters. In 2012 alone, an estimated 32 million people were displaced. Most of these displacements were triggered by weather-related hazards like floods, storms and wildfires. In addition, hundreds of thousands of people were forced to move due to slow-onset disasters like droughts. Most of these people are known as “internally displaced persons” because they settle elsewhere within their countries. However, many also flee across borders to other countries. In recent years, a major drought developed into famine in the Horn of Africa and throughout 2011 and 2012, large numbers fled — in particular Somalis and Ethiopians — in search of assistance and protection. The majority went to Kenya or Yemen; some travelled to more-distant countries like Egypt. And now, recent reports say failing rains, severe malnourishment, enduring conflict and poor sanitation mean Somalia is again facing a humanitarian crisis, with 50,000 children “at death’s door” and 2.9 million Somalis at risk of hunger. Currently, disaster survivors who cross borders are in a type of vulnerable limbo because, to date, no instruments explicitly provide entry, status and rights to individuals on the basis of natural hazard-related disasters. Existing refugee laws and conventions, like the 1951 Refugee Convention, do not legally consider such displaced people as refugees because they are not necessarily “being persecuted for reasons of race, religion, nationality, membership of a particular social group or political opinion”. “Individuals leave for another country for a variety of reasons, but in many cases the driving factor is related to the loss and deterioration of livelihood. Induced by weather-related events, factors such as destruction of crops or flooding motivate people to cross borders,” says Dr. Tamer Afifi of the United Nations University Institute for Environment and Human Security (UNU-EHS) who co-authored a new report with the Norwegian Refugee Council (NRC) that is shining light on how this complex and urgent issue is evolving in the Horn of Africa. The Horn of Africa is a region in Northeast Africa that includes Eritrea, Djibouti, Ethiopia and Somalia and has a population of 103 million people. As the poorest region in Africa, most countries here already suffer from widespread poverty, political tensions and violent conflict and thus face a terrible struggle when hit by sudden and slow onset disasters like floods and drought. These disasters are especially destructive here because many inhabitants are pastoralists and small scale farmers with climate-sensitive livelihoods and little education. 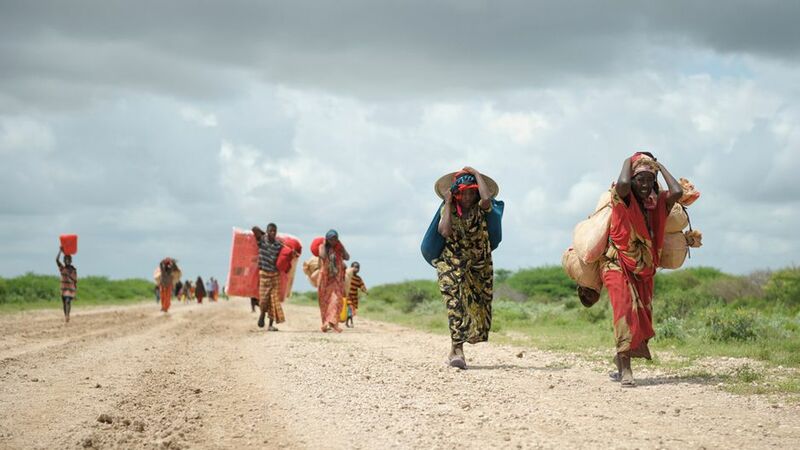 The new report, “Disaster-Related Displacement from the Horn of Africa”, was launched at the Nansen Initiative Greater Horn of Africa Regional Consultation meeting in Nairobi last week. Initiated in October 2012 by the Swiss and Norwegian governments, the Nansen Initiative is a state-led, bottom-up consultative process for building consensus on the development of a protection agenda addressing the needs of people displaced across international borders by natural hazards, including the effects of climate change. The UNU-EHS/NRC research analyzed the policy and legal options in cross-border, disaster-related displacement, including both formal laws and policies and effective socio-legal issues in the Horn of Africa, Kenya, the Middle East and North Africa, with a particular focus on displaced Somalis and Ethiopians. Additional observations emerged from the case studies in Kenya, Egypt and Yemen. The very thorough report thus explores protection from displacement, protection during displacement and durable solutions to displacement. The report comes at a crucial time given the 2013 commitment by the UN High Level Dialogue on International Migration to collect existing principles and practices in an organized operational framework for providing protection and assistance to migrants in crises, including in conflict and disaster situations. “As extreme weather increases in intensity thousands are at risk of being displaced. Many of the displaced receive some assistance, but the support varies. There is a need for more predictive protection and assistance. We must start in the hardest affected regions,” said Nina M. Birkeland of the Norwegian Refugee Council, a contributor to the report. Here is a summary of the report’s general findings and a summary of the case studies. Most Somalis and Ethiopians displaced to Kenya, Egypt and Yemen were influenced in their cross-border movement by natural hazard-related disasters, which interacted with additional social and political factors, such as ethnic and politically based discrimination. While a protection gap exists at the global level for those displaced by disasters, on the ground at the local and national level it was clear that climate factors interacted with other social and political factors to displace people. Therefore, existing human rights and refugee instruments often remain relevant in the case of disaster-related displacement. On the ground, rules and laws are dynamic and adaptive and vary in their local and national manifestations. For example, in Yemen, Islamic norms of hospitality may provide protection in some disaster situations by influencing the application of law and protection. Laws hindering access to the formal labour market by refugees put them at risk of becoming exploitable informal labour. As a result, few refugees planned to remain in the receiving countries for the long-term. This suggests a need of exploring labour migration channels and potentially expanding them in the wider region, as many are moving in search of better livelihoods. Without exception, displaced persons mentioned (lack of) livelihood options as one of the main reasons for leaving their homes and going to Kenya, Egypt or Yemen. Most respondents were pastoralists, small-scale farmers and agro-pastoralists. The displaced persons were mostly concerned about limited rights to work and lack of livelihood options — other concerns included shelter, food security, education, access to health care, security — including security against gender-based violence, and durable solutions, such as resettlement. Kenya is the African country with the largest displaced Somali community. According to UNHCR Kenya (2014), there were 482,390 Somali refugees in the country in December 2013. Due to generalized violence in South and Central Somalia, Kenya considers all people coming from the region as prima facie refugees. Lack of rain in Somalia in 2010 and 2011 resulted in the worst annual crop production in 17 years, high animal mortality and soaring food prices. Unsurprisingly, lack of livelihood options was consistently mentioned by respondents who were mainly pastoralists, farmers, or agro-pastoralists, as one of the main reasons for leaving Somalia. In addition, many cited getting new skills in Dadaab as an incentive. However, a refugee’s freedom of movement in Kenya is restricted; they are usually contained in camps run by UNHCR and NGOs in remote areas of country and have few livelihood opportunities. Women face particular challenges, including fear of gender-based violence, with 14 percent saying they themselves had been exposed to gender-based violence and 31 percent saying they knew somebody who did. De facto gradual integration is taking place for some Somalis, since the relationship with the local host community has been historically good. This is mainly due to the fact that the North Eastern Province of Kenya where most refugee camps are located is ethnically Somali. Other Somalis hope for resettlement or to reach European and other developed countries. Egypt is both a refugee-receiving and a transit country. Most refugees in Cairo were Somali with agro-pastoralist backgrounds. At the time of the fieldwork, the issue of refugees was not as prominent in political discourse, since most of the focus was on post-revolutionary Cairo and the run-up to presidential elections. In Egypt, individual refugee status determination is implemented rather than prima facie, which means that each individual must meet all criteria in the refugee definitions, including proof that displacement is due to persecution, generalized violence or another reason recognized in law. In response, people adjusted or highlighted certain parts of their narratives, so that they were more likely to be afforded refugee status. Lack of livelihood options was often given as the reason for leaving, as well as the interaction between armed conflict and drought. Refugees have limited access to work, health services and education and no right to permanent residency. However, many do informal work mostly within the Somali refugee community. There are no camps. Newcomers usually live together in shared apartments. Staying in Egypt was not a long-term solution, most refugees hoped for resettlement or to reach Europe or other developed countries. Others hoped for eventual return to Somalia. Since the early 1990s, Yemen has received thousands of Somalis and Ethiopians; it is the country in the MENA-region with the largest displaced Somali community as well as a main transit country for Ethiopians. Most interviewees had experienced ethnic, religious and politically based discrimination and persecution at home, as well as generalized violence which interacted with droughts and other disasters. Most Somalis seek refuge upon arrival on a prima facie basis. Ethiopians must rely on individual refugee status determination, which has a 20 percent acceptance rate. The majority of Ethiopians plan to move on to Saudi Arabia and the Gulf countries for work. Local and religious law may play an important role in addition to — and sometimes even replacing — formal state law (e.g., the duty of hospitality linked to Islam). However, Yemen is under strong pressure from Saudi Arabia and other neighboring states to stop the flow of people transiting through Yemen into their territory. The main protection risk for migrants and refugees to Yemen is trafficking. Few saw staying in Yemen as a long-term option, with most trying to make their way from Yemen to Saudi Arabia, the Gulf States or to the United States, Canada or Europe. To download the report or the fact sheet, see below.